Gi FlyBike is electric, smart, maintenance-free, and folds in one second. 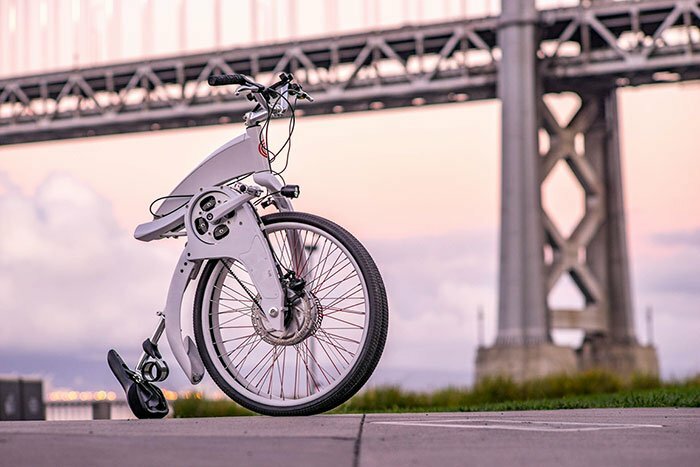 Gi FlyBike is an electric, smart, maintenance-free, folding bicycle with full size, 26” wheels. Crafted from ultra-lightweight aircraft grade aluminum, the bike can be taken anywhere – bus, train, office, elevator, or locker. The “FlyFolding” system is a patent pending custom arrangement of mechanical parts. It allows the bike to be folded in one second and in one simple motion, making it the world’s fastest folding electric bicycle. Easily roll it onto a bus, train, subway, or elevator. When in folded state, the bike is designed to be wheeled around like a roll-able luggage so you never have to pick it up. The 250-watt rear-wheel motor is large enough to propel you for 40 miles (~60 km). You can choose between three speeds of electric assistance or ride Gi Fly as a normal bike. Climb hills and get to your destination quickly, without breaking a sweat. Bike theft is less of an issue with Gi Fly’s integrated locking system. It detects how far you are from your folded bike through Bluetooth technology and locks automatically when you are 10 feet (~3 meters) away. Return to your bike and the Gi unlocks automatically. The mechanical lock can be manually controlled through the Gi Fly mobile application. All of Gi Fly’s features are controlled through a mobile app. To make sure you stay in control, the bike has a centrally located USB Port and phone holster. The bike will charge your phone as you pedal towards your destination. Riding should not be limited to sunlight. Front and rear LED lights controlled by the mobile app allow you to cruise safely at night. Rear brake lights shine automatically at the touch of Gi’s hand breaks. If you bought a bicycle in the past 120 years then it probably has a chain. Thankfully, some bike innovators came up with the belt drive transmission. Gi Fly’s belt drive is steel-reinforced and is free of grease and oil. With the Gi FlyBike, you will never have to deal with noise, dirty pants or broken chains again. The company says that their solid-anti puncture tires, specifically designed for electric bikes, withstand everything that would normally stop you flat with a pneumatic tire – nails, glass, sharp metal objects, and thorns. Don’t know how to get to your destination? Not a problem. The Gi Fly mobile app uses Google Maps’ full-view, worldwide bicycle navigation to give you step-by-step route instruction. Gi Fly’s saddle has a shock absorbing system with silicone gel inserts and extra thickness. It comes customized with a layer of Kevlar (the synthetic material that stops bullets) around the rear component – that makes for one of the most comfortable and most durable saddles on the market. The Gi Fly mobile app’s built in bike sharing program allows you to lend your bike to friends and family safely and securely over the company’s encrypted API. By providing them with a virtual key, a buddy or loved one can unlock your folded bike. Miss your bike? Don’t worry – your friend can ride up until the moment you request your bike back. Gi Fly comes equipped with the uniquely sleek Plume Mudguard. When streets are wet, Plume suspends over the rear wheel. Instantly coil Plume away under your saddle when you don’t need it. Fold your Gi Fly and Plume coils automatically – your fingers never touch mud, dirt, or grime. The Gi FlyBike is available online for $2,729 on the company’s website. It gives people the freedom to ride without excess or restraint, and it looks to be the future of urban commuting. You should know that someone is scamming the public offering this bike for $66.00 at this website: https://birthhth.com/products/the-first-e-bike-that-folds-in-one-second .